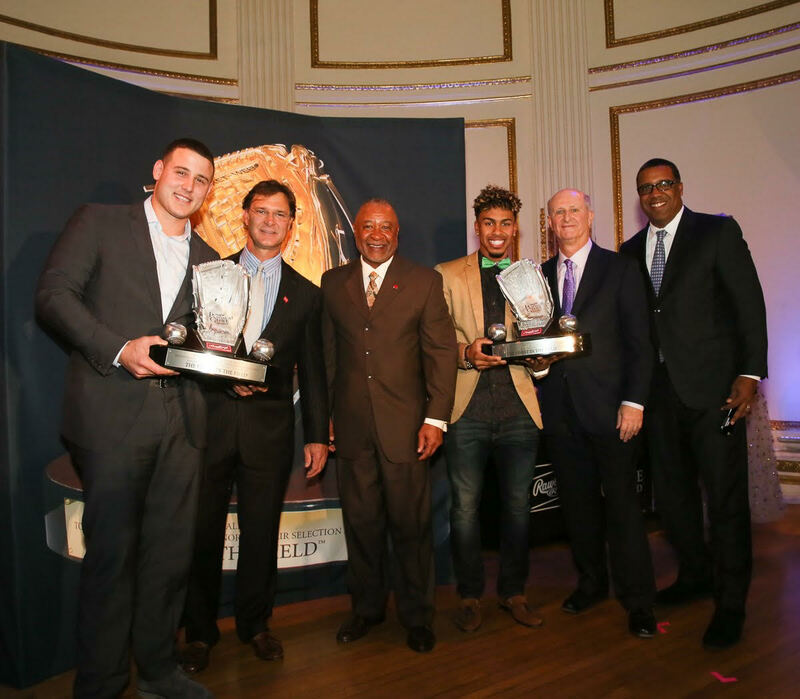 NEW YORK - November 11, 2016 - Rawlings Sporting Goods Company, Inc. a subsidiary of Newell Brands, announced that Cleveland Indians™ shortstop Francisco Lindor and Chicago Cubs™ first baseman Anthony Rizzo won the 2016 Rawlings Platinum Glove Award™ presented by the Society for American Baseball Research (SABR) in their respective Leagues. The winners were unveiled Friday night during the 2016 Rawlings Gold Glove Award® Ceremony, where the game's defensive stars accepted their hardware from some of baseball's greatest legends. This marks the first time since the Rawlings Platinum Glove Award™ started in 2011 that two first year Rawlings Gold Glove winners have won the Platinum Award. Lindor became the first Puerto Rican shortstop and is the youngest shortstop since 1980 to win the Rawlings Gold Glove Award®. He is also the youngest player to ever win the Rawlings Platinum Glove Award™. At 27 years old, Rizzo became the youngest player in Cubs franchise history to win a Rawlings Gold Glove Award® and the Platinum Glove Award. The Rawlings Platinum Glove Award™ winners are determined by combining votes based on an adjusted SABR Defensive Index™ for each of the nine Rawlings Gold Glove Award® winners in each League and the votes from baseball fans worldwide. 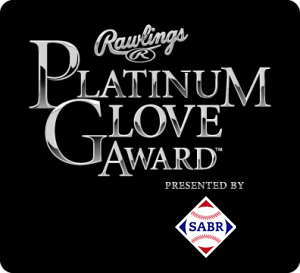 "Now in its sixth year, the Rawlings Platinum Glove Award™ fan inclusion platform continues to prove that baseball fans worldwide know, value and celebrate defensive greatness," said Mike Thompson, executive vice president of marketing for St. Louis-based Rawlings. "This year's fan vote greatly exceeded our expectations; with passionate fans from countries across the globe letting us know who the best defenders are in baseball." Based on the final SABR Defensive Index, Lindor led all American League shortstops with a 18.5 SDI, and Rizzo finished the season with a 8.6 SDI. Voting began at the conclusion of the 2016 Rawlings Gold Glove Award® Announcement Show presented by Fanatics on ESPN's "Baseball Tonight" on November 8, 2016, and ended 24 hours later. Fan discussion surrounding the Award on social media was fostered in part by some team's open campaigning for their respective nominees. ESPN's Eduardo Perez and SABR's Gennaro announced the winners live on stage during the Hollywood award show format. Kevin Kiermaier of the Tampa Bay Rays™ and St. Louis Cardinals™ catcher Yadier Molina won last year's Rawlings Platinum Glove Award™ in each League. The Rawlings Gold Glove Award® is a registered trademark owned by Rawlings Sporting Goods Company, Inc. The award is correctly identified as the Rawlings Gold Glove Award®. The name should not be shortened, abbreviated or otherwise misused. Proper identification of this service mark using the registration symbol and the Rawlings name is important to protect the integrity of the program and perpetuate this worthy tradition. For more information, please visit www.rawlingsgoldglove.com. Rawlings Sporting Goods Company, Inc. is an innovative manufacturer and marketer of sporting goods worldwide. Founded in 1887, Rawlings is an authentic global sports brand, trusted by generations of athletes of all skill levels. Rawlings' unparalleled quality and expert craftsmanship are the fundamental reasons why more professional athletes, national governing bodies and sports leagues choose Rawlings. Rawlings is the Official Ball Supplier and Batting Helmet of Major League Baseball®, the official baseball of Minor League Baseball™ and the NCAA®, and the approved baseball, basketball, football and softball of the National High School Federation®. For more information, please visit Rawlings.com or by phone at (314) 819-2800. Newell Brands (NYSE: NWL) is a leading global consumer goods company with a strong portfolio of well-known brands, including Paper Mate®, Sharpie®, Dymo®, EXPO®, Parker®, Elmer's®, Coleman®, Jostens®, Marmot®, Rawlings®, Oster®, Sunbeam®, FoodSaver®, Mr. Coffee®, Rubbermaid Commercial Products®, Graco®, Baby Jogger®, NUK®, Calphalon®, Rubbermaid®, Contigo®, First Alert®, Waddington and Yankee Candle®. For hundreds of millions of consumers, Newell Brands makes life better every day, where they live, learn, work and play. This press release and additional information about Newell Brands are available on the company's website, www.newellbrands.com. The Society for American Baseball Research (SABR) is a non-profit organization dedicated to fostering research and disseminating the history and record of baseball. Founded in 1971, SABR has more than 6,500 members worldwide and has established itself as a vibrant baseball community and a premier distributor of ground-breaking baseball information. SABR features 70 chapters and 30 research committees, and produces three annual publications – two editions of The Baseball Research Journal and The National Pastime – in addition to other print and e-books. SABR also hosts annual events, including the National Convention each summer, and the SABR Analytics Conference in March in Phoenix. For more information about SABR, go to SABR.org. This page was last updated November 12, 2016 at 12:35 am MST.